The good news about this quiche recipe is that it literally just takes a few minutes to whip up. No crust necessary. It is great for brunch or even those nights when you want breakfast for dinner! 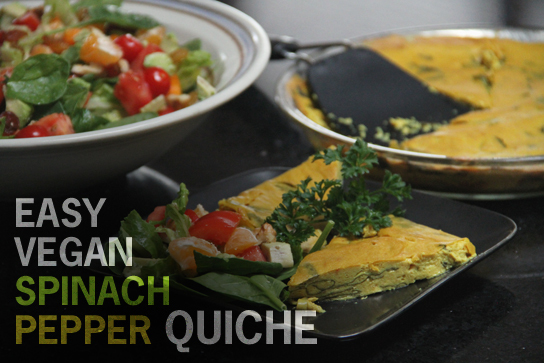 This nutrient-packed quiche is a delicious way to amp up your greens. The base of this quiche is packed with protein, turmeric and nutritional yeast resulting in a cheesy flavor. Nutritional yeast is rich in B complex vitamins, especially B12, essential amino acids and trace minerals, all necessary for healthy nerve function and energy production. 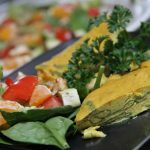 This eggless quiche will surprise and delight you, not to mention nourish you! This easy spinach bell pepper quiche recipe is super simple to make, it's vegan, and also gluten-free! Grease a shallow 9" pie dish and set aside. Combine all ingredients, except spinach and pepper, in a vitamx or food processor and bled until smooth and creamy, stopping to break up chunks and scrape the sides as necessary. In a bowl mix chopped spinach and pepper. Using a spatula, spread the mixture around so it's even and tight.